I met him at a Minor League game at Bright House Field in Clearwater, Florida in 2014, when the Charlotte Stone Crabs, whom he was the hitting coach for, came to play the Clearwater Threshers. As I'm sitting next to the Stone Crabs dugout, Jim Hoff, recognizes me and comes over to say hi. He asks whose card I have and I showed him as I pronounced the name "Joe Zeek-lee." Jim then pronounces it correctly and says, "ah, Joe Zeck-lee." I was so glad he corrected me. I hate mispronouncing peoples names. It helped so much when I was finally able to call for Mr. Szekely after the game. 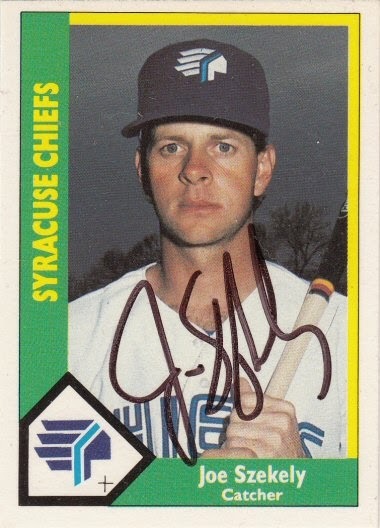 Joe signed a 1990 CMC card #337.